President Dwight D. Eisenhower’s health problems and President John F. Kennedy’s assassination heightened support for a constitutional amendment to address the exercise of presidential power in the event of presidential disability and to provide a process for filling a vacancy in the vice presidency. S.J. Res 1 was introduced on January 6, 1965 by Senator Birch Bayh (D-IN), chair of the Subcommittee on Constitutional Amendments of the Senate Judiciary Committee. It was similar to a resolution that had passed the Senate on September 29, 1964. Bayh introduced the resolution while he continued to gather co-sponsors, who are indicated by a check mark by their names on the attached Senate roster. The 1,530 copies of the resolution ordered printed included the names of those cosponsors. United States. Congress. Senate. Office of the Secretary. "S.J. Res. 1." S.J. Res. 1, January 6, 1965; “Original Senate Joint Resolutions, S.J. Res 1-S.J. Res. 33” folder, Box 22; Office of the Secretary of the Senate; 89th Congress; Records of the U.S. Senate, RG 46; National Archives.. Accessed 19 April 2019. http://acsc.lib.udel.edu/items/show/47. S.J. Res. 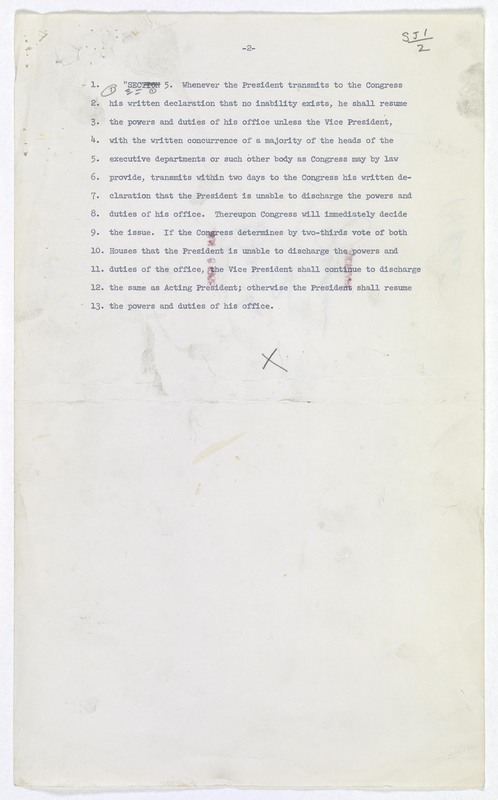 1, January 6, 1965; “Original Senate Joint Resolutions, S.J. Res 1-S.J. Res. 33” folder, Box 22; Office of the Secretary of the Senate; 89th Congress; Records of the U.S. Senate, RG 46; National Archives.